Rodent infestation causes food contamination, damage to property and worst of all, the spread of disease and infection. The single most important thing is to protect your family and home from these dreadful pests by investing in the best mouse trap available. With so many in the market, which one to choose can be a tough decision, but fear not we've got you covered! Buying a Mouse Trap: How do You Choose the BEST? So you’ve been trying to catch some mice in your household but always end up failing. Have you bought the right traps? Did you set them up properly? Used the right type of bait? There is much to learn about trapping mice before you can successfully do it. And a word to the wise, if you haven't already determined what type of critter is keeping you up at night, it pays to do further research to ensure you choose the right bait and the right trap for the pest you are dealing with. But don't worry, we've got your back! Read on to discover the different types of rodent traps so you can decide which one is best for you. Just read on and make sure to apply each helpful tip if you are serious about ditching your unwanted housemates. Before buying a trap, it's important to understand how they work, the different types available and most importantly the method of control. How would you like to catch and dispose of your household pests? How fast would you like to get rid of all of them? Each home owner has his or her own preferences that would define the best item. If you don’t want to kill rodents, or are concerned about trapping the wrong animal, this is the best choice for you. It simply lures animals into it with bait and closes the door to trap them. Afterwards, you can release the rodent in a safe area away from your home. Live traps usually come in big sizes; hence, you can use it to trap bigger nuisance animals. The best type of trap is indeed relative. As a potential user, you have your own personal needs and preferences that comprise a big part when choosing a device to use. Just make sure about what you want, and you will surely get the best choice. This type traps and instantly kills rats through strong electric shocks. It is said to be the most humane way of killing rodents because the trapped animals die immediately without feeling any pain. It is also one of the most hygienic trapping methods and you can dispose of the dead rodent without touching it. This is the most common type of mouse trap. It kills the mouse using it's jaws when the rodent triggers the trap by taking the bait off the trigger. Death is usually quick and humane as the powerful jaws will break the rodents neck instantaneously. Should you want to use this type, make sure to keep it away from your children and pets. Check it occasionally to see if a mouse has been trapped. Sometimes cleanup can be messy. This traps the mouse as it walks across the sticky board. Deployed as a lethal method, sticky traps are the most inhumane form of rodent control, causing unnecessary suffering due to the distressed animals doing anything they can to escape death - including chewing off their own limbs. Its also one of the most unhygienic traps. They are completely indiscriminate and can cause suffering to any unlucky animal that finds its way onto the trap. And although the most cost effective form of trap, we strongly recommend other devices over the glue board. Needless to say, this should be your first priority when buying any product. Is your prospective item effective in catching rodents? Does it work fast and well? It is also important to be certain about the type of pests you have at home. No matter how effective a device is, it will not work well if you’re trying to catch the wrong animal. For instance, you may have bought a device that could perfectly catch a little mouse only to find out that what you need to trap are bigger animals. Opt for items that you can easily handle and manage. Buy ones that are easy to set and make disposal more convenient for you. Also, choose ones that are safe and easy to clean. Meanwhile, you can also find some items that come with instruction manuals. You should aim to find an item that can be reused time and again. Make sure your chosen item is made of sturdy materials. Also, see to it your device cannot be easily destroyed by the trapped animal regardless of its size. Of course, you need to allot a budget for your prospective item. Stick to it and never opt for features that you don’t need. However, you should be open to spending a little more if you find a good-quality item. Purchasing any product requires responsibility from buyers like you. Keep these tips in mind if you want to get the product that best suits your requirements and needs. Don't want to kill rodents? Want to ensure you're not accidentally eliminating the wrong animal? We reckon the AB Humane Live Cage is your best option if you aim to trap and release nuisance animals. It allows users to release unintentionally caught animals like squirrels, rabbits, small pets, etc. It works with any bait. It is designed to be easy to use. It comes with a spring triggered door mechanism. It is designed as a non-lethal solution. 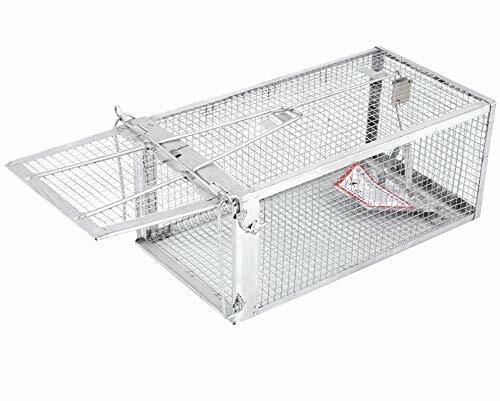 Allowing users to release unintentionally caught animals, the product is indeed a safe device that makes it possible to humanely trap and eliminate rodents if you choose. It is safe for children and pets because it is non-toxic and most importantly non-lethal. Made of aluminum, it is resistant to rust and corrosion. It generally works great, especially with smaller animals. Easy to use and easy to set. It is escape-proof; thanks to its spring triggered door mechanism with latch. Its fine wire mesh makes it harmless to the caught animal. The product continues to evolve to become the most effective product that catches small animals. It has a good construction. This specific model is not suited to trapping larger animals, but different sizes are available. Really sensitive mechanism that can be triggered a bit too easily. It does not come with a handle that could provide more safety when dealing with the caught animal. This product is definitely a good pick if you prioritize the common good. You get to have the peace of mind and choose whether to kill or release the trapped animal. Moreover, it is sturdy and comes with a good construction. It is also fantastic value for money and will last for years if looked after. However, it comes with some downsides just like any normal product in the market. First off, it may not suit larger animals. Its door has a tendency to be easily triggered. Lastly, it makes disposal a little bit challenging because it does not come with a handle that could be used to deal with the caught animal safely. If you aim to trap and kill rodents in a humane way, the Eliminator Robust Electronic Rat and Rodent Trap may be the perfect item for you. It comes with numerous benefits that users can enjoy. PRECISION DETECTION TECHNOLOGY - Features precision rodent detection technology, instantly activating the trap and ensuring that rats and all other rodents get instantly killed. Effective for Rats, Mice, Squirrels, Chipmunks and other similar rodents. 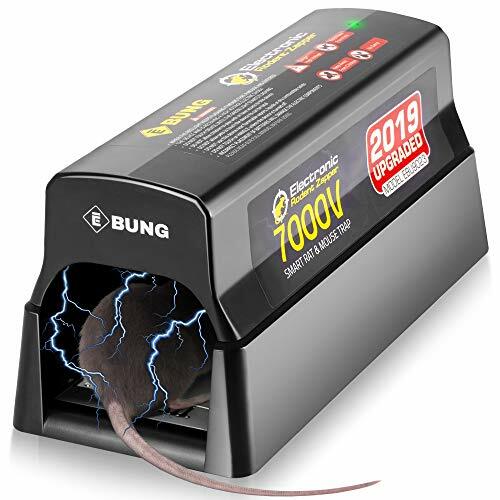 SIMPLE TO USE- Simply insert the batteries or plug in the device with the provided adapter, apply a small amount of bait, such as peanut butter, etc., The Electronic Rat Trap will emit a 7000V shock when a rodent enters into the trap, instantly killing the rodent. 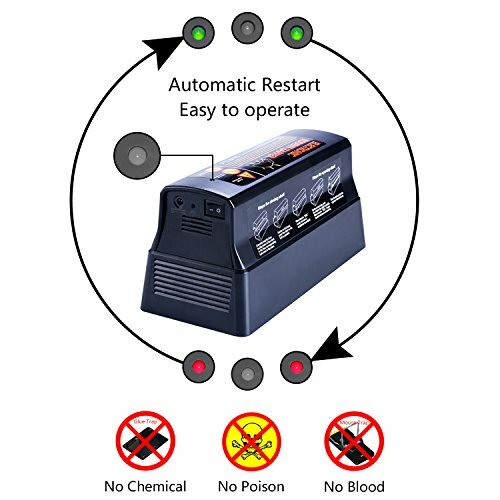 The indicator light will flash indicating a rat has been exterminated and needs to be discarded. NO MESS & SAFE - Get rodent free without the use of dangerous poisons and chemicals / Discarding the rodent is a breeze with absolutely no mess. To discard the exterminated rodent, simply pick up the device, slide the dead rodent into the trash bin and place the trap back to its location ready for its next catch. No blood and no touching of dead rodents. PLUG-IN or BATTERIES - Comes with a 3 Ft. plug-in adapter for hassle free unlimited kills. Can also be operated with 4 'D' batteries (batteries not included), allowing up to 30+ kills per set of batteries. / Features also an extension plugin- indicator light for hard-to-reach areas, that enables to check for trapped rodents without the need to check the actual device. / Dimensions: 11" x 4.5" x 5"
It uses precision rodent technology. It suits mice, rats, chipmunks, squirrels, and other rodents. It comes with three-feet plug-in adapter, but also provides the option to use four D batteries. Each set of battery can make more than 30 kills. It does not contain harmful chemicals or poisons. It has an indicator light that flashes when a rodent has been exterminated and needs to be disposed. It can kill rodents fast in a humane way. It comes with enhanced components. The precision technology it uses makes it possible to instantly activate the trap and immediately kill rats and other rodents. Coming with an adapter and battery slots, the product provides convenience to users. It is safe, for it does not use harmful chemicals or poisons. It is easy to use and does not cause mess. The user just needs to pick up the device once a rodent has been killed and then slide the dead rodent into the trash bin. It has the capacity to kill rodents fast and humanely; thanks to the 7000V electric shock that it emits. It is easy to set. The enhanced components that come with it help ensure great performance. It works great in homes, warehouses, commercial kitchens, factories, etc. While it may be good for an occasional rodent but not for infestation. There may be some minor problems with the quality control. Generally, this product aims to trap and kill rodents fast and in a humane way. This is made possible by its 7000V electric shock that can instantly kill a rodent and cause no pain. It comes with enhanced components to ensure good performance, and provides convenience through the options to use an adapter or batteries. The product is likewise easy to set and use, and generally works fine. As for the downsides, this trap may not suit infestation although it is effective for occasional rodent problems. It also tends to have some minor quality control issues. 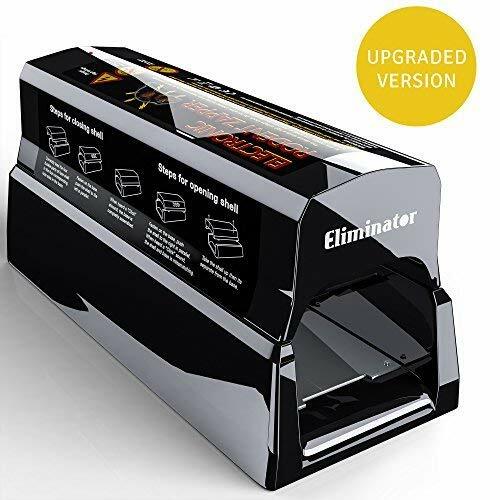 The Eliminator Electronic Rat and Rodent Trap indeed comes with numerous benefits that outnumber and outweigh its disadvantages. 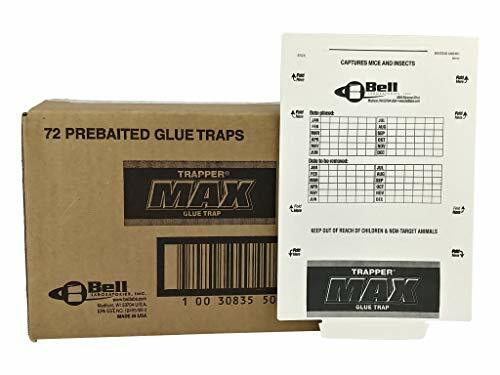 Traditional wood and metal snap traps have been improved by hygienic and durable plastic designs. 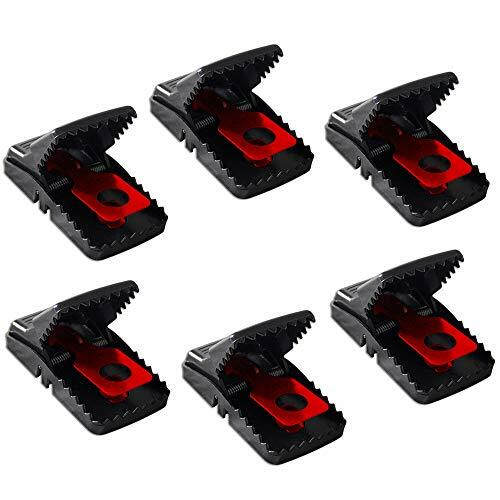 Kraftex are among the best of this new breed of snap traps. STOP DISEASE SPREAD - It's a well known fact rats spread diseases quickly - a group of rats is called a mischief, after all. Get control over contamination in your home by using our mega power spring snap traps - will kill instantly each and every time. It's the smart way to protect yourself, your children and your pets against rats. QUICK SNAP, PROBLEM SOLVED - With super-trigger sensitivity, our traps ensure rats won't suffer when they're caught. Spring traps are proven by experts to be the most humane traps for killing rats - unlike poor quality wooden or glue traps that can kill cruelly, or mouse size traps which only wound rats. At Kraftex we can confidently say that the first snap will be the last. Buying from us means buying with confidence. Fix your mouse and rat problem today. SPEEDY. SAFE. SANITARY - Made with durable, stain and odor-resistant plastic, Kraftex traps are reusable and reliable. You'll have no direct contact with rodents using these hygienic traps. They're designed to be an investment - rather than wasting your money on cheap, difficult to clean wooden traps. EASY TO SET AND BAIT - Enjoy the easy-bait design of our traps to set with confidence. Just a flick of the wrist and the bait is in - ready to tempt your unwanted pests. We've designed our traps to ensure total safety for your fingers - including colored pressure plates that make baiting even easier. You can place our traps in difficult to reach spaces - such as lofts, small alcoves, or on top of fences - for maximum effect. If you're looking for a traditional snap trap, the Trapper Pack by Kraftex should be top of your list. 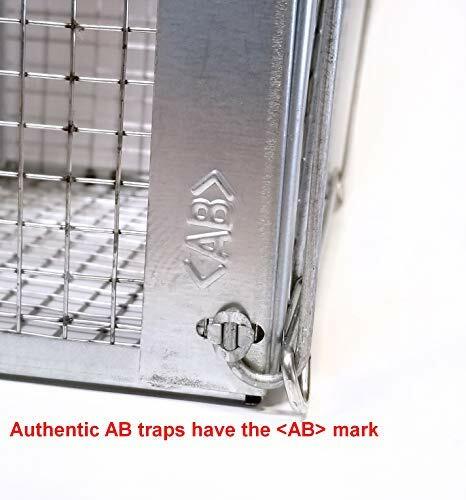 Well designed and made from hard-wearing materials, you will be able to reuse these traps as required to keep the mice at bay. And because you are buying a pack, you can be assured of the coverage you need at a much better price point. There are different myths about rodents. For a successful pest control infestation, it pays to know the truth about these false beliefs. The truth is rodents generally prefer seeds and fruits over cheese. Experts choose peanut butter, meat, and even chocolate as bait. Since rats get most of their water from the foods they eat, it is best to pick moist foods if the climate is dry. Rodents can evade your cats and dogs by not passing by the areas where they usually roam. With pet food around, expect more rodents to come, feast on it, then scamper away at the sight of your pets. Rat poison takes days to take effect after consumption. You’ll never know where rodents will die. If infestation is inside your home, better options are snap traps or glue boards. By using these traps, you can easily see the dead rats and dispose them right away. Be sure to wear gloves in handling the cadavers and placed them in sealed bags. Although a dirty environment invites rodents, even a spotless, pristine home or building can be a shelter to a rodent population. As long as they find access, rodents can seek refuge in your home as they feast on your garbage, left over foods, seeds, and grains. No rodenticide has been proven to prevent foul odor to decaying rodents. To eliminate the odor from decaying rodents, you may use odor control products. Rodents are carriers of certain bacteria and viruses. The spread of diseases is far more alarming than the damage to property caused by gnawing. You can repair such damages but the breakout of parasites and diseases are more aggravating. There is no truth to this. Rodents get their water from the food they consume. They nest in a place where they can get food and water nearby. By completing the right measures, you can prevent and control infestation. For serious infestations, let the experts handle the job for you. The bottom line here is really down to what type of trap you are most comfortable with. Do you want to simply trap the pest alive and then release it? Or do you want to kill it? Once you have answered that question, the decision then becomes one of the features you require and the budget you have available. You also need to be realistic and in most cases, even with smaller homes, you are going to need a few traps and not just one. You also need to be patient and it is likely you will need to experiment with types of bate and with the positioning of the traps to reach ultimate effectiveness in your pest trap and control activities. Whichever trap you do choose, with the right attention to the factors above, you will be able to bring your infestation under control. And don't forget, Cerceris was built to provide you with support, advice and product guides for your home vermin control requirements. If something isn't covered in one of our current guides, if you let us know we'll make sure to get it researched and published as quickly as possible.